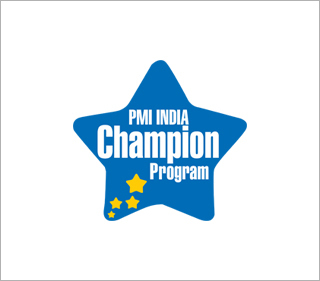 For the benefit of project management aspirants, PMI India Champion Jaydeep Chakraborty has written two blogs on frequently asked questions on Project Management Professional (PMP)®, membership, details about Professional Development Units, re-validation, and examination preparation tips in collaboration with PMI West Bengal Chapter. In May, he guided PMP aspirants during an examination preparation program arranged by the chapter. He made a presentation on changes in the examination that took effect on 11 January 2016. During the session in Salt Lake, West Bengal, he guided 15 PMP aspirants from different organizations on the examination process, starting with filing the application. During 22-25 April, PMI India Champion B. Koti Reddy from Hyderabad facilitated a mentoring session on the PMI Agile Certified Practitioner (PMI-ACP)® at Cybage, Pune. As many as 28 professionals including managers, senior managers, and delivery managers from various business verticals and business units, who intend to take up the PMI-ACP® certification, attended the workshop. Mr. Reddy covered both the basics and advanced discussions on agile approaches to project management including how to apply an agile technique for a given situation, and why to choose a particular technique for a project. The session included several games, video presentations, and exercises to engage the participants, and help them apply learnings effectively to situations. PMI India Champion Yogesh Sachdeva conducted a one-day event, "PM Day" at American Express, Gurugram in April that was attended by 25 managers. 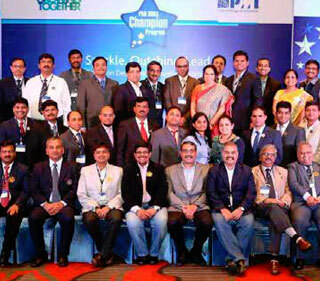 The event has helped garner interest among participants about PMI membership and certification preparations. PMI India Champion Ajay Kumar conducted a session on "PMP Certification - Value for Management" on "PM Day" in April for 10 newly inducted project managers in IBM India, Noida. The two-day awareness session was focused on "PM Fundamentals" for 12 IBM team members. PMI India Senior Champion Sunil Telkar, PMP, coordinated the second "PM Pathshala", a four-day workshop on PMI's A Guide to the Project Management Body of Knowledge (PMBOK® Guide) at Praxair, Bangalore in March. Anuj Sharma, managing director, Praxair India, set the theme of the workshop with his opening address. Jacob Varghese, head – aerospace & defense, PMI India, provided insights on the latest trends in project management. Mr. Telkar started the workshop with a session on "Introduction to PMI & the PMBOK® Guide". Then he and his colleagues moved on to explaining the Knowledge Areas of the PMBOK® Guide. Mr. Telkar took sessions on Project Integration Management, Project Cost Management, and Project Stakeholder Management. His colleague, Sathyanarayan V., PMP, delivered sessions on project management processes and Project Time Management, sharing his vast experience as a project manager at Praxair. Vekatadas Devishetty, PMP, spoke on Project Risk Management and Project Scope Management. Madhan B., PMP, took the participants through Project Communications Management and Project Human Resource Management, while Gopal K., PMP, delivered sessions on Project Procurement Management and Project Quality Management. The workshop, attended by around 30 middle managers, was followed up by a two-hour examination on the PMBOK® Guide on 31 May. On 28 April, Mr. Telkar was invited to "Renaissance," the annual festival of the mechatronics engineering department of Acharya Institute of Engineering, Bangalore, as the chief guest. He addressed over 200 engineering students on the basics of project management, and introduced them to PMI and the Certified Associate in Project Management (CAPM)® certification. On 21 April, PMI India Champion Ravindra Kulkarni conducted a one-hour session on the "Introduction to PMP Certification" for module leads and above roles for the employees of GlobalEdge Software, Bangalore wherein he took the 25 participants through PMI offerings and the way to proceed for the PMP certification. 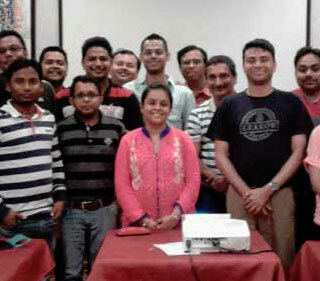 In the same company, a four-day PMP awareness session was conducted for PMP aspirants on May 13-14 and May 20-21. There were over 20 participants and the sessions were conducted by PMI India Champions – Ananth H.V., Preethi Sankaranarayanan, Ravindra Kulkarni, Kush Kumar, and Hari Prasad. It was coordinated by Raghavendra Guruprasad, Champion Designate from GlobalEdge Software. The sessions included video presentations, mock tests, practical questions, and case studies. The session, Introduction to Project Scope Management, was conducted by Mr. Ananth; Project Communications Management by Mr. Kulkarni; Project Time Management and Project Cost Management by Preethi Sankaranarayanan; Project Quality Management, Project Procurement Management, and Project Risk Management by Mr. Prasad; and Project Stakeholder Management, Project Integration Management and Project Human Resource Management by Mr. Kumar. Mr. Ananth also conducted a full-day awareness session at Hindustan Aeronautics Limited, Bangalore, on "Trends in Project Management" on 5 May, which was attended by middle and senior managers. During March-April, PMI India Champion Manikandan M. spoke on Lean Six Sigma and Project Management Knowledge Sharing at Sathyabama University, Chennai, for MBA first year students on 9 March; on "Map Your Destiny - Project Management" at PGP Agriculture College, Namakkal, for MBA final year students on 7 April; and on the "Latest Trends in Operations - Project Management" for first year MBA students in SRM University, Chennai, on 15 April. PMI India Champion Sowmya Narayanan guided 31 project managers through a PMP certification preparation workshop in Hewlett Packard Enterprise, Bangalore during the first week of March. PMI India Champion Sathish Chandrasekaran conducted a four-hour risk management practitioner session for over 30 professionals from Cognizant on 28 March. The next day he delivered a six-hour workshop on project management with case studies from PMI to over 50 associates from Cognizant. He utilized resources from the Champion portal to provide participants an overview of PMI certifications. On 29 March, there was a full-day PMP helping hand session at Bosch India, Bangalore. Delivered by PMI India Champions Raghavendra Muliya, Anand Lokhande, Duraideivamani Sankararajan, and Kush Kumar, the sessions attracted close to 100 participants. Most of them expressed interest in achieving the PMP certification in the next few months. PMI India Champion Koti Reddy conducted a lunch and learn session at the United Health Group's NCR campus on PMIACP® for about 350 nominated employees and scaling agile for 100 employees on 11 March. He followed up these sessions with an in-depth two-day workshop on "scaling agile" and a three-day PMI-ACP® workshop starting 28 March. As an immediate impact, five employees took up PMI membership and 10 employees enrolled for PMI-ACP®.